Happy Anniversary to the McKinleys! 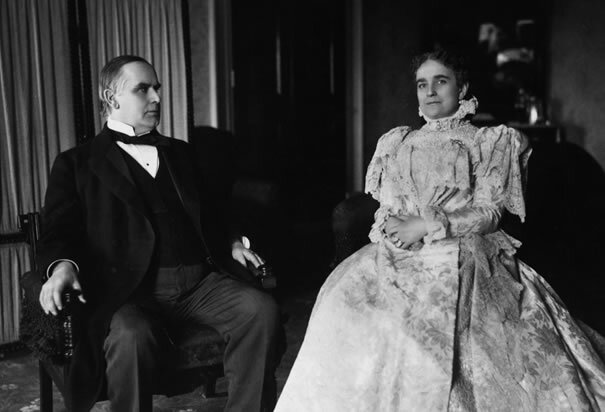 Today, we commemorate the 146th anniversary of the marriage of Ida Saxton to William McKinley. They were married on January 25, 1871. In 1896, the McKinley’s celebrated their silver anniversary. The year 1896 proved to be a very active year for the McKinleys. Of course, William McKinley had just retired to life as a lawyer in Canton, after having served seven terms in the United States House of Representatives as well as two terms as governor of Ohio. According to Carl Anthony, the McKinleys returned to their house in Canton, the same house in which they had lived when first married and rented from Ida’s father John Saxton, which was sold when McKinley went to Congress in 1876, and which they again rented in 1896. McKinley wrote to Whitelaw Reid, publisher at the New York Tribune, “We have got back our old home in Canton, keeping house for the first time in twenty-two years, and in the house [in] which twenty-five years ago we took up our housekeeping as newly married people.” During this time, the McKinleys celebrated their twenty-fifth wedding anniversary, having been married on January 25, 1871. For the twenty-fifth anniversary, the couple received many gifts from friends and admirers all over the country. Other authors also mention the McKinleys’ silver anniversary. Louis L. Gould mentioned that the couple held a lavish party in Canton to celebrate their silver anniversary in early February 1896. According to author Charles William Morris, “Their silver wedding anniversary was celebrated on January 25, 1896, in the same house in which they had begun their home-making. In the meantime Abner McKinley, the Major’s brother, had married the daughter of the Rev. Mr. Endsley, and Mr. Barber, one of the ushers at the wedding in 1871, had married the bridesmaid, Miss Mary Saxton. They, and many others who had attended the wedding of Major McKinley and Miss Saxton, were at the celebration of the twenty fifth anniversary.” According to Dorothy and Carl J. Schneider, five hundred guests attended this gala. According to Carl Anthony, the McKinleys hosted two days of parties in the house to belatedly celebrate their silver wedding anniversary. The party was also held for Ohio Republicans. Some six hundred attended, forcing the McKinleys to attend them in two shifts. Mrs. McKinley, wearing her wedding gown, remained by her husband’s side for six hours. Carl Anthony described the festivities in his book Ida McKinley: The Turn-of-the-Century First Lady Through War, Assassination, and Secret Disability. Weeks earlier, a thousand engraved invitations to the McKinley Silver Anniversary on Wednesday, February 5, were mailed for either the afternoon or evening reception. On the unseasonably mild day, Canton was animated with buggies conveying guests to the house. The McKinleys were “at home” to friends—and the nation. The front lawn was “brilliantly illuminated” by two locomotive headlights, the stone path to the front steps carpeted. “Thayer’s Orchestra” of eight musicians played continuously while the dining room offered chicken salad, lobster salad, ham, olives, pickles, salted almonds, cucumbers, sherbet, petit fours, macaroons, and coffee. Ida, disappointing temperance advocates, had claret wine and an intoxicating “roman punch” available. Guests were directed to a second-floor coat-check room by Fred Floyd. Downstairs, the fell into a line wending into Ida’s parlor, received first not only by Ida’s sister Pina and the Major’s sister Helen, but also Hanna and Herrick, underlining the event’s political purpose. Repository editor George Frease then led a few guests at a time to the bay window, where the couple sat encircled by roses and carnations, their favorite flowers; Ida was dressed in her wedding gown. It was significant that as the February 6, 1896, Repository reported, “Each guest was warmly received with a kindly pressure of the hand by both Major McKinley and his lovable wife…” To those who assumed that some unspecified malady was the reason why Ida sometimes did not shake hands, this greeting affirmed that whatever it was, it was neither severe nor permanent. Likewise, having the Major also seated to receive guests made it less obvious that Ida couldn’t stand for long. And so, this lavish affair also served to reintroduce the future President and his wife to public life. Carl Sferrazza Anthony, Ida McKinley: The Turn-of-the-Century First Lady Through War, Assassination, and Secret Disability. Kent, Ohio: The Kent State University Press, in cooperation with the National First Ladies’ Library. 2013. Kindle Edition, locations 1727-1734.